The interior of the Yucatan is very arid, and rivers run underground, creating fantastic caves and sinkholes (called cenotes). There are two large sinkholes at Chichen Itza, which would have provided enough water to sustain such a large settlement. The land on which the ruins sit was privately owned by a local farmer until the state of Yucatan purchased it in 2010. Also in 2010, Chichen Itza was placed on the list of the New Seven Wonders of the World along with the Christ the Redeemer Statue in Rio de Janeiro, Brazil; the Great Wall of China; the Machu Picchu Inca ruins in Peru; the ancient city of Petra in Jordan; the Roman Coliseum in Italy; and the Taj Mahal in Agra, India. At each spring and autumn equinox the edge of the Temple of Kukulcan pyramid casts a shadow that resembles a serpent. This occurs on the west side of the north staircase when the sun rises and sets. Chichen Itza is the second most visited place in all of Mexico. 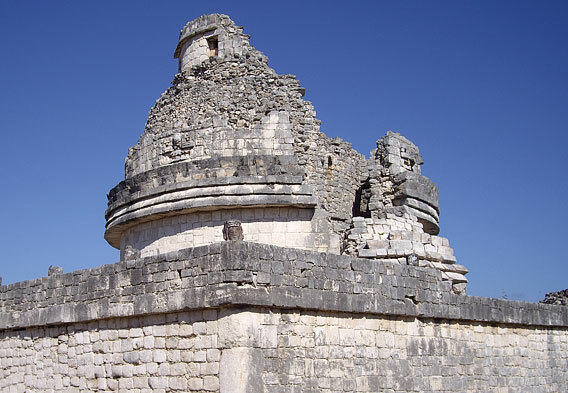 Within the complex are numerous stone buildings representing a variety of pre-Columbian Mayan architectural styles. The buildings are linked by an intricate network of raised paved roads called sacbeob (singular, sacbe) that are as significant as the roads built by the ancient Romans throughout Europe and by the Minoans of ancient Greece. More than 100 of these roads have been found, and they lead in all directions, probably once connecting with other settlements scattered around the Mayan Empire. The grand Temple of Kukulkan (the Mayan name for Quetzacoatl) is also known as El Castillo, meaning The Castle. This is the iconic step pyramid that is the most recognizable structure in the complex. There are stairways to the summit on all four sides of the pyramid, and each stairway consists of 365 steps. The steps are steeper than normal steps, so the climb is fairly strenuous. But the view from the top is quite spectacular and well worth the effort. Caracol is the Spanish word for “snail,” and this striking structure received this nickname because of the snail-like spiral staircase in its interior. It is a circular structure rather than rectangular like the other buildings, and sits prominently on a platform. Because of this unusual shape, most experts believe this was an observatory. This theory is bolstered by the fact that the windows and doors are aligned with the astrological path of Venus. 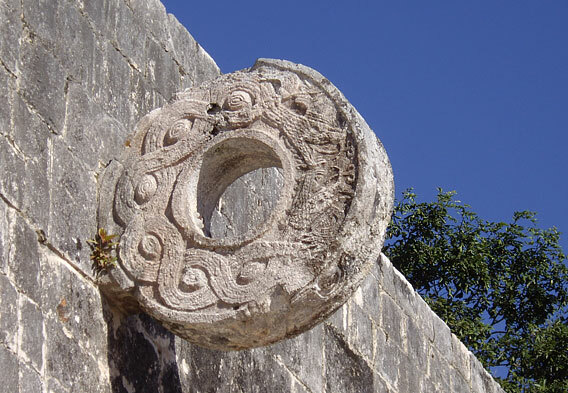 Ball courts are common features within many Mayan ruins, and there are a number of them at Chichen Itza. The most impressive is the Great Ball Court, which is the largest such sports court found in all of the Mayan ruins across Mexico and Central America. The court is about 223’ x 545’ in area and bordered on two sides by stone walls nearly 40 feet high. Rings, carved in the shape of intertwined serpents, sit high on each of the walls. Carvings of ball players can be seen at the base of the walls, including one decapitated player. It is believed that the captain of the losing team may have been dealt a sentence of death by beheading. 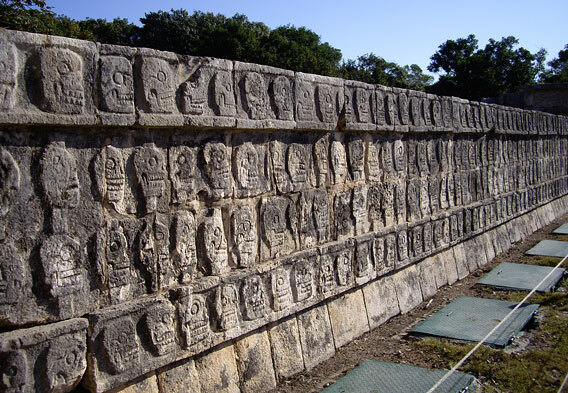 The Wall of Skulls is also called Tzompantli, which is actually an Aztec word. The first one the Spanish invaders saw was at Tenochtitlan, and they used this word for all the ones they subsequently saw in both Mayan and Aztec structures. The one at Chichen Itza is located along one side of the Platform or Temple of Jaguars. There are three platforms in the Great Plaza next to El Castillo, but this is the only one where the heads of sacrificial victims were placed. The others were used for shows and performances. One wall has the rack of carved heads. The other walls show human sacrifice, skeleton warriors, and human hearts being eaten by eagles. Other sights to see in the complex of ruins include the other two platforms—the Platform of the Eagles and Jaguars and the Platform of Venus. There is also the impressive Group of a Thousand Columns, which once would have supported an extensive series of roofs. There are also numerous smaller temples including the elegant Temple of Carved Columns, the Temple of Small Tables, the Palace of Ahau Balam Kauil decorated with carved jaguars (balam is the Mayan word for jaguar), and The Temple of the Warriors. Some of these temples are quite well preserved, others are in ruins. The roads, especially Sacbe Number One, are also quite impressive.